"Coercive force, discrimination and violation of the rights of the faithful of the Ukrainian Orthodox Church have already been noticed by international human rights organisations. . . . We ask the state authorities not to interfere in church affairs, and thereby not contribute to the incitement of religious hatred through their actions . . . We also appeal to the government not to facilitate forcible seizures of our Church parishes"
"It must be admitted that the historical and canonical arguments presented by the Patriarchate of Constantinople regarding its own right and the possibility of interfering in the affairs of other Local Churches is totally unfounded, artificial, false, and contrary to the Church’s canons. Accordingly, the Patriarchate of Constantinople does not have any right whatsoever to interfere in the church life of Ukraine." 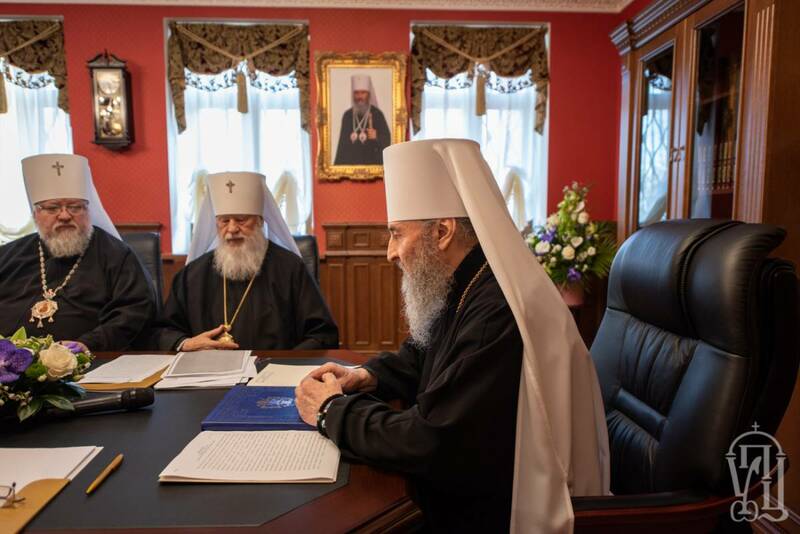 Editor's Note: The Holy Synod of the Ukrainian Orthodox Church has issued an official statement regarding the current situation in Ukrainian and world Orthodoxy. As reported on the news.church.ua site, the bishops explicitly reject the jurisdictional overreach being attempted by the Patriarch of Constantinople. They also call on the governmental authorities to end their human rights abuses, and to stop the illegal seizure and confiscation of church properties. 1. We state that the idea of ​​overcoming the church schism in Ukraine by the granting of a Tomos of autocephaly to the non-canonical church groups (“UOC-KP” and “UAOC”) has turned out to be a grave error. None of the Local Orthodox Churches has recognised this illegal act perpetrated by the Patriarchate of Constantinople and a large part of the Local Churches, notably, the: Antioch, Russian, Serbian, Cypriot, Albanian, Polish, and Orthodox Churches in the Czech lands and Slovakia, in various forms, have already expressed their disagreement with the decisions made by the Constantinople Patriarchate. Local Churches have also confirmed that they do not recognise the newly established “Orthodox Church of Ukraine” (“OCU”) and regard the clerical Cheirotonia in this structure as illegitimate and prohibit its own clergy to have any prayerful contacts and liturgical concelebration with its representatives in any form whatsoever. Thus, there was no positive response nor indeed acceptance by world Orthodoxy of the actions perpetrated by the Patriarchate of Constantinople; which, in fact, has attempted to legalise the schism. Accordingly, the legalisation of the schism – is not the way in which church unity can be achieved. We remind you that according to the historical-canonical tradition of the Church, autocephaly is provided only to a single Church within a certain state, and not to any part that has broken off from the Body of the Church.